In a previous post I explored how we are motorizing children by presenting a German car rush hour board game for your consideration. 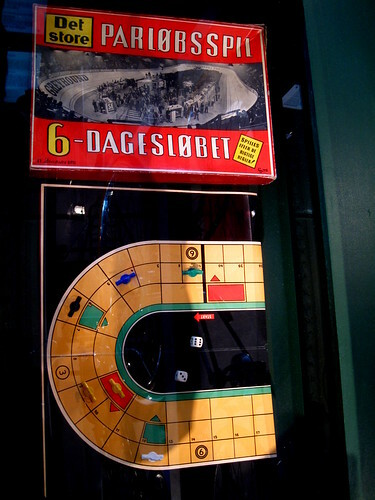 At the Copenhagen by Bicycle exhibition at the Copenhagen City Museum there was this Six Day Race board game on display. Didn't actually catch the date on it, sorry, but it is from at least the 1950's, if not earlier. No idea how to play it so don't ask. But the Six Day Races are iconic in Danish history. They used to draw massive crowds. There is still one main race in February here in Copenhagen but the folksy appeal is no longer.